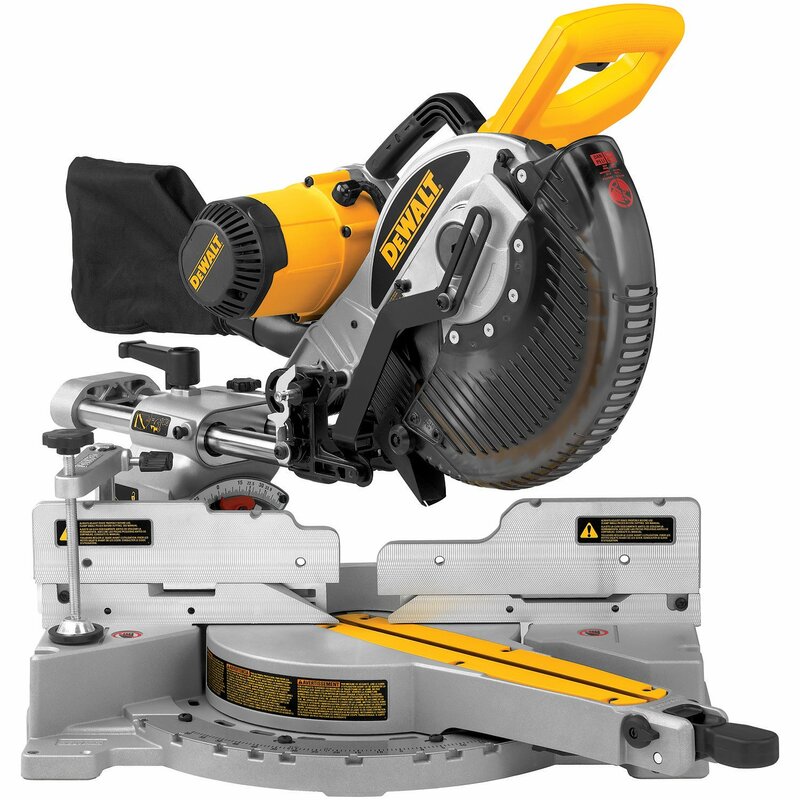 In the collection of miter saws, this product stands out. From its 10 inch (254 mm) blade to its flexibility for both DIY use and professional contractor projects, the Dewalt DW717 packs practical and attractive features. 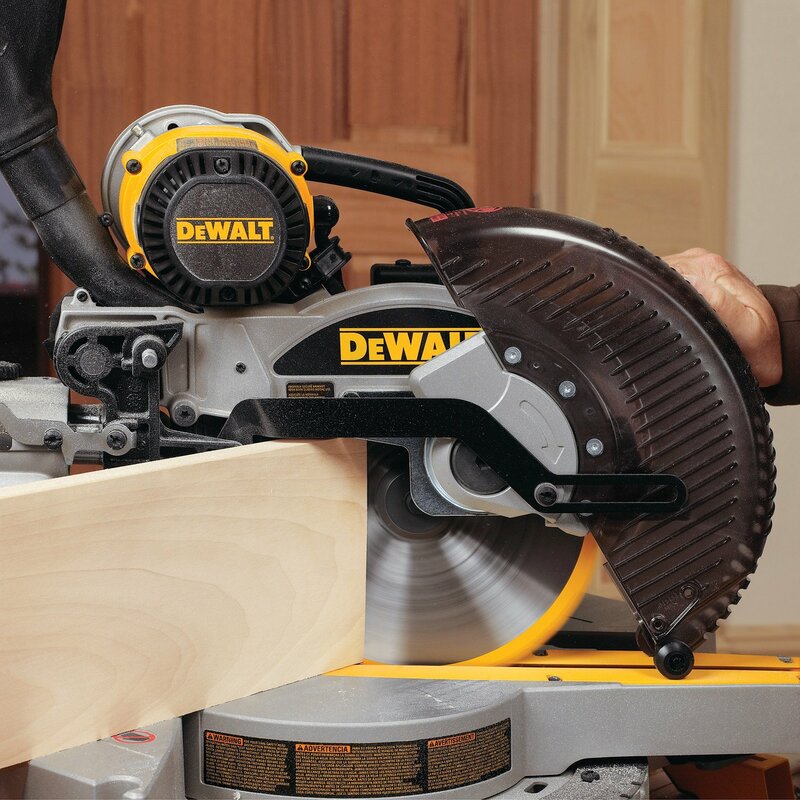 Quality : From the cross cut stop positions to the overall design, you have specialized features that are ideal for both vertical and horizontal cut capacity.The Dewalt DW717 is one of few 10-inch sliding compound miter saws that have the largest cutting capacity on the market. Usability :A built-in ergonomic handle makes the saw portable and ready for use upon arrival at the destination. Bevelling has a 0-48 degree cut angle allowance. Performance : Using the back fence design, you can crosscut even 2×12 inch boards at a 45° angle. The stainless steel miter detent plate is adjustable and has 11 positive stops to help increase productivity and precision. Robustness: Enhancing durability and accuracy are the dual horizontal steel rails equipped with practical clamping features and linear ball bearings. You can perform accurate vertical cuts thanks to the perpendicular support brought by the machined base fence support. A specialized bevel detent system with 7 positive stops makes for fast and accurate cutting. It has a tall sliding fence for base and crown molding tasks. With a no-load speed of 4000 rpm, the 15-amp motor is as sturdy as it is consistent. An innovative clamping mechanim ensures steady productivity with negligible risk of error. There is an adjustable cam-lock miter handle. Speaking of miter, the capacity for mitering is extensive. You can opt for any angle from 0-60 degrees left and 0-52 degrees right. This is one of the DWS717’s most versatile features. The miter detent plate has 11 positive stops, is made of stainless steel (durable and easy to clean), and can be adjusted. The bevel cutting advantage has drawn so many people to the DWS717. Capable of cutting anywhere between 0 and 48 degrees, most cutting projects out there just got simpler. In addition, users have expressed praise at being able to flip the saw and not the cut; this is highly convenient. Everything is almost readymade with this saw machine. No minor technical adjustments are required of users who have shown enthusiasm at being able to use the saw once it is immediately out of the box. Laser system that creates a distinct line of light to show you where the cut is going to happen. This is certain to give you a clear picture of how the cut is going to turn out. Bevelling is made extra simple thanks to rails and tall fencing features. With bevel and miter cut options like what you have read so far, the DWS717 makes it possible to increase project capacity, productivity, and efficiency. The dust bag is a little too small. Not only can it contain only a small portion of sawdust it requires regular emptying. Where long sessions are involved, a majority of dust is still outside and can pose breathing related problems (short and/or long term). Getting external vacuums, dust collectors, or cleaners resolves this issue. They could have attached a better stock blade on this device. There have been cases of sliders showing sticky behaviour. Cannot power through thick hardwoods. This saw is best for medium-duty cutting tasks. If you are planning to use heavier wood pieces, go slow to prevent machine errors. We really liked the fact that the DWS717 has extended miter and bevel settings. With the largest range of adjustment options among miter saws (as tested by Wood Magazine), you will be pleasantly surprised to learn that you can adjust all the way to 60 degrees left and 52 degrees right. Where bevel range is concerned, you have 48 degrees space either way. Its ability to saw through 6-inch wide boards when they are placed on edge is double the capacity of most other saw machines on the market. You can get more precise cuts using the override feature on the detent plate to lock wood pieces at unconventional angles. 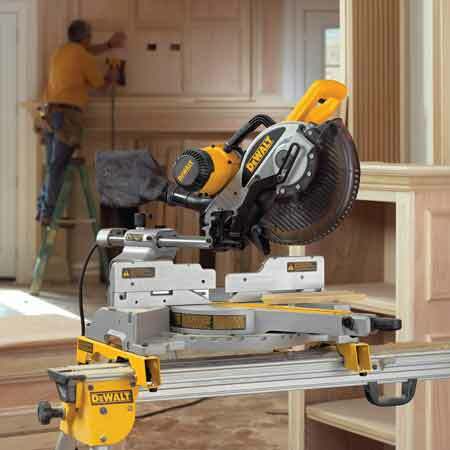 We say yes to the Dewalt DWS717, and we will say it again. Equipped to handle most medium-duty projects, this device is perfect for professionals, beginners, and hobbyists alike. It has one of the smoothest sliders of products in the same range. While adjusting the bevel can be a bit of a challenge, miter adjustments are quite easy. The bevel lock is positioned at a slightly inaccessible spot, namely atop the sliding rails. However, compared to rear-mounted locks, this feature is leagues better. Handling, portability, flexibility, and range, these are some of the words that best describe the Dewalt DWS717. It is reliable for four years and more. However, the mid-grade factory blade needs changing; it simply is not good enough for an otherwise excellent saw machine. The lever-action miter lock is easy to lift or depress and does not stick out; this adds to the design’s convenience for users. Once you have learned the tricks and eased out the kinks (like replacing the blade with a higher-grade one and understanding bevel adjustments) you have a performer whose output will be nothing short of amazing.